Grundig TV remote codes. 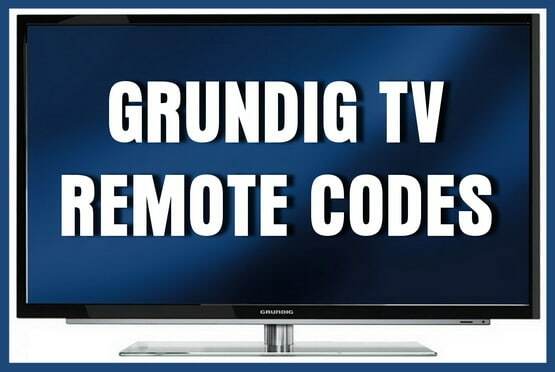 If you need the remote codes for your Grundig TV to control it with a universal remote control, these codes will operate your Grundig TV. We have 3 and 4 digit codes below for your TV that are working. If the first does not work keep trying the codes down the list. Grundig multi-brand remote codes for TV’s. 1 – Turn on TV. 2 – Press and hold the TV key and enter the codes for your brand. 3 – If your TV turned off then you entered the right code and setup is complete. Need help with more Grundig remote codes or setting up your remote with your Grundig TV? Please leave a comment below. OK I lost my remote and bought a replacement online GLED2211HDVW/A. I have a stupid question which key on the remote is the TV key? I have a Grundig P14-4705 W tv… a oldskool one..
None of the codes are working on my tv..
Can you give me the codes for a Grundig TV p37 080. I have tried codes have held the Grundig button, the green button then entered each code above with no success, my tv is a Grundig GLCD2206HDV, Remote is a young LR-LCD 707E. I have also got a Young LR-LCD-707E that is not working with my Grundig not sure the no for the TV though, would be interested in knowing how to get it to work as I have only just purchased it and have followed the very limited instructions on the pack but it still isn’t working?? I tried all Grundig 4 digits codes on my RadioShack family favorites 4-in-one remote. Do you have 3-digit code for Grundig, remote is Chunghop Q-X33E. I am using a LPG TV and I can’t find the code for the TV, can you please help. My TV is on child lock and I don’t have a remote. Do you mean you have an LG TV? We cannot find any codes for a LPG TV.